Three hot, dry summers in a row may have had a cumulative effect on the mobility of deer ticks, say researchers. Researchers say the cumulative effect of arid conditions during recent summers could be killing ticks, and possibly explain why there have been significantly fewer cases of Lyme disease reported in Maine this year. Lyme disease cases are on track to be the lowest in at least three years, and the hot, dry weather this summer might have been a contributing factor. Dry weather reduces the mobility of deer ticks, and also might reduce tick populations, experts say. 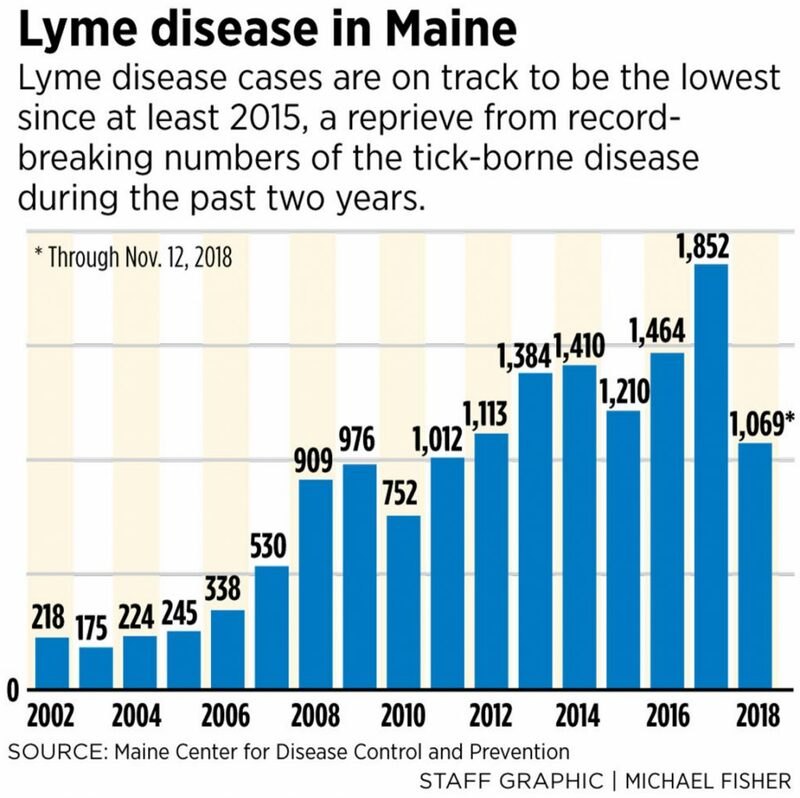 Through Nov. 12, there were 1,069 Lyme cases in Maine, well below last year, when there were a record-breaking 1,852 cases for the entire year. Maine could end up close to or below the 1,210 cases recorded in 2015, which, after the harsh 2014-15 winter, was the fewest number of Lyme cases since 2012. Lyme cases have skyrocketed from a few hundred per year in the early to mid-2000s to about 1,400 cases or more annually during the past five years. The increase has been abetted by an expanding range for deer ticks. Lyme disease can cause flu-like symptoms, swelling, neurological problems like Bell’s palsy and joint pain. Some, but not all, people get a bull’s-eye rash where they were bitten by a tick. If caught early, Lyme disease can be treated with antibiotics, but untreated it can cause long-term health problems, especially in the joints and nervous system, according to the U.S. Centers for Disease Control and Prevention. Traditionally, most Lyme cases are reported from April through October, when the arachnids are most active and people are more likely to be outdoors. Tick researcher Chuck Lubelczyk, a field biologist for Maine Medical Center Research Institute, said it’s not just that the 2018 summer was abnormally dry, but that the string of three straight dry summers has “stressed” tick populations. Rainfall was below average this summer, while high temperatures in July and August were above normal, according to the National Weather Service. Submissions to the University of Maine’s “tick identification lab” are 40 percent lower than last year, the lab reported. Mainers can send ticks to the lab to find out what type bit them, and whether it is a Lyme carrier. The Maine Center for Disease Control and Prevention also has a new “real-time” Lyme disease tracking system at www.maine.gov/lyme where residents can get daily updates on the number of Lyme cases reported to the agency. The contrast between this year’s tick populations and 2016 is intriguing, Lubelczyk said. Experts say dry weather may be reducing tick populations. In 2016, dry summer weather in Maine caused the ticks to go dormant. That summer, Mainers reported significantly lower levels of Lyme disease. But when the rains returned in the fall, the deer ticks came roaring back, and so did Lyme disease, Lubelczyk said. Last year’s warm and wet autumn also brought out large numbers of deer ticks. This year, a similar pattern occurred with a dry summer followed by more rainfall in autumn. But, Lubelczyk said, the ticks didn’t come back in 2018. “We did not see a resurgence this year,” he said. Griffin Dill, integrated pest management professional at the University of Maine Cooperative Extension, said that even though the deer tick’s lifespan is two years, the cumulative effects of dry summers could possibly impede the ticks’ ability to reproduce. Dry summers also could shorten a tick’s life span, affecting future populations. 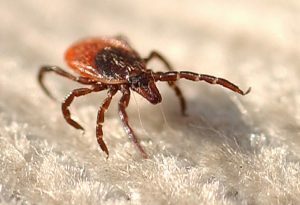 Dill said the deer tick is proving that it can live well under snow, even though it is inactive during the winter. Snow acts as an insulating blanket for the ticks. But dry weather affords no similar protection, he said. Lubelczyk said the wet spring this year, along with a healthy deer population and large numbers of rodents, were setting the ticks up for a banner year. But the populations never seemed to get going in the summer and fall.